Nationwide election fraud in the 2016 U.S. Election season to date may exceed anything yet known in American history. Yet this top story in 2016 is conspicuously absent from corporate news headlines, even if numerous voting “irregularities” were reported in many states. The fraud is believed to have occurred throughout the Democratic primaries, where – in state after state – the alleged vote rigging systematically shifted votes to Hillary Clinton from Bernie Sanders, who should have been the real winner in the primaries. According to vote fraud attorneys Cliff Arnebeck and Bob Fitrakis, a “Coup d’état” occurred in California on June 7th, and vote rigging has occurred in most states during the 2016 Democratic primaries. Racketeering lawsuits are being filed to expose the election fraud and the “serial vote thieves.” Says Arnebeck: “Hillary Clinton has been used for the purpose of scuttling the Bernie Sanders campaign for president.” Concurring with the analysis of the evidence are computer security experts, mathematicians, independent reporters, and The Institute for American Democracy and Election Integrity, among others. Arnebeck’s lawsuit demands that the media stop suppressing Exit Polls from 24 states, which he believes exposes evidence of criminal activity. As such, the media is “complicit in the crime… and accessories after the fact.” (See Edison Research Exit Poll statistics further below.) Since 2003, Edison Research has been the sole provider of Election Exit Poll information for ABC, CBS, CNN, FOX, NBC and Associated Press, i.e. the U.S. corporate media. The next challenge is to penetrate through the corporate media blackout and disinformation on this topic, and the apparent unwillingness of politicians and party officials to admit that anything may be seriously amiss in U.S. elections, other than a nod towards supporting campaign finance reform. We will dwell on some of these background facts, since little of this is well publicized. And we look later on at some planetary patterns, both larger and smaller, that give some context to this situation and why it would be so spectacular this year. Mathematician and vote fraud expert Richard Charnin reports systemic voting machine tampering in all states in 2016 to date and vote-flipping in many states, including California, where he says 15% of the voting machines were flipped from Sanders to Clinton, and 2.6 million votes were still not counted over two weeks after the election. As of June 24, 605,000 ballots remain to be counted, but so far the increase in Sanders votes now gives him the win over Clinton in 28 counties, with a tie in one county. Among the many statistical improbabilities favoring Clinton, the hand-counted votes for Sanders are always higher than his machine-counted votes. Also, Clinton wins by even larger percentages in states using DREs (direct recording electronic devices), i.e. unverifiable and hackable voting machines now outlawed in Europe and in some U.S. states. All across the nation, a fraudulent pattern has emerged, where millions of votes have gone uncounted or purged, mainly those for Bernie Sanders. At least 13 states do not meet international standards for being certified. According to these standards, unadjusted scientific Exit Polls are used to compare with official news reports the following day. If there is a discrepancy of 2% or more between the two, the election is considered worth investigating for fraud and not to be certified. Attorneys Arnebeck and Fitrakis are among the most experienced in litigating against vote fraud, having prosecuted the case of vote fraud perpetrated in Ohio in the 2004 U.S. Presidential Election. Fitrakis calls it “organized crime. “The evidence is piling up to a mountain the size of Everest as the corporate media blackout continues,” says a spokesperson for Stanford University on June 17, 2016, confirming Democratic election fraud. Arnebeck and Fitrakis cite how election vote fraud with electronic voting machines and purging of voters records has increased in the U.S. since 2000, when vote fraud in Florida stole that election for George W. Bush. Unadjusted National Exit Polls in 2000 showed a Gore win over Bush, 52 to 47%, but were later “adjusted” to give Bush a 51 to 48% win. Mathematician Richard Charnin goes further. Upon examining U.S. election vote statistics, 1988-2008, notably the historical fact of Unadjusted Exit Poll data, he found systemic fraud throughout that 20-year period, shifting the vote an average of 8% to the Republican presidential candidate: “Exit Polls are always forced to match the bogus recorded vote. The pollsters admit that it is standard operating procedure.” But Charnin calls the 2016 election “in your face” – the nationwide fraud is so blatant. It is beyond anything he has seen so far in his study of the 1988-2008 U.S. Election data, which only became available to him in 2010. Can astrology help us to understand why no one in the U.S. government is talking about this crucial issue? And why the corporate media blackout? In fact, the media blackout on this subject has gone on for several decades. We can trace some roots of the current problem to the early 1980s, coinciding with the start of the Information Age in 1980-81 and the triple Jupiter-Saturn conjunctions in Virgo (sidereal zodiac), ruled by Mercury, planet of communications and by extension: information technology. Triple conjunctions occur more rarely, and give extra acceleration and intensity. Compound this with the triple JU-SA conjunctions in FIRE in 1940-41, which began a new military age: The Atomic Age. The Internet evolved out of a military project from 1969, with its key expansion from 1981. Further, despite their obvious benefits, advances in computer technology and increasing accessibility of information also bring other unfortunate uses of sophisticated metadata: overreach of surveillance, spread of disinformation, systematic tampering of computerized voting machines and vote tallying; thus, if unchecked – electoral fraud and theft on a massive scale. DRE voting machines first became available in the mid-1980s and more widely used since the 1990s. Vote fraud experts now consider them “the premiere issue” in vote rigging, and this correlates with Charnin’s study of U.S. Election data, 1988-2008 and the start of the Information Age, 1980-81. Though many elite and establishment voices may protest that the U.S. is above such practices, in fact the U.S. ranks the lowest in electoral integrity – 47 out of 47 longstanding established democracies, according to the Electoral Integrity Project, jointly run by the Dept. of Government and International Relations at the University of Sydney, and the John F. Kennedy School of Government at Harvard University. But the deeper reason may reside in the power of the sidereal EARTH period, 1961-2199, when the Jupiter-Saturn conjunction cycles predominate in earth signs. (These conjunctions occur one or more times every 20 years, and recur in predominantly one element – fire, earth, air or water – for an average of 243 years.) Jupiter’s significations are weakened during the EARTH period, while Saturn’s significations gain power. Saturn rules over business interests and big corporations, while Jupiter rules over nation-states and humanitarian concerns such as ethics and integrity of the vote. Thus, during the EARTH period we have seen increasing dominance of corporate conglomerates over nation-states, and the triumph of Profit over the Public Good. In the case of the Racketeering lawsuit against the media, we see how all of this comes together. The media protects its corporate masters, while governments and politicians may not act on known vote rigging because it gives them the advantage they seek. The veneer of a democracy is thus maintained as long as the vote is not contested and citizens not informed. “As Jupiter represents journalists and journalism, its relative weakness during EARTH dominant periods greatly reduces the power of journalists to document wars and conflicts and keep the balance of power between citizens and their government. Journalists, for their part, are increasingly swayed by access to power rather than by holding accountable those in positions of power.” Edith Hathaway, In Search of Destiny: Biography, History & Culture As Told Through Vedic Astrology, 2012, p. 38. Since Jupiter rules over ethics and humanitarian concerns, including the Public Good, we see a steady decline that can be documented in U.S. politics and its political parties. The party that traditionally protected the working class and middle class in the U.S. was the Democratic Party, but since the early 1970s that has steadily declined so that by Democrat Bill Clinton’s presidency, 1993-2001, most of his signature policies were those of the conservative Republicans and the previous GOP president, stripping protections for the middle and lower classes, especially workers’ unions and minorities. All of this would have been unthinkable in the era of the New Deal. Meanwhile, more and more tax advantages were given to the wealthy and the corporations, favoring the bankers and the technocrats, and thereby further increasing the income inequality gap in the U.S. that began with Reagan’s policies in the early 1980s. 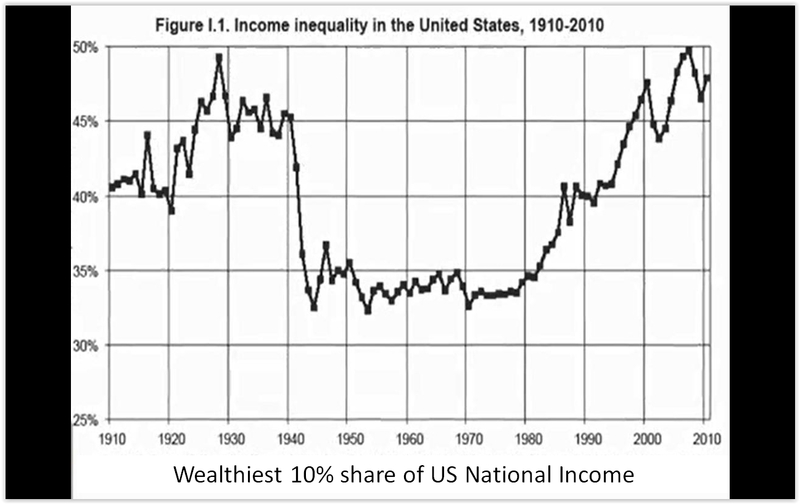 Now the top 1/10th of 1% of Americans (the 20 wealthiest families) owns as much wealth as the bottom 90% of Americans. “This is not a moral economy,” as Bernie Sanders says. Lobbyists representing corporate interests now far outnumber actual legislators. American citizens have risen up in 2016 in protest of a government that no longer represents them, fueling both the Trump and Sanders campaigns in particular. They both had the largest and most enthusiastic crowds of any candidates, Sanders with a record 1.5 million people over the course of his campaign. This Anti-establishment reality also looms large in the UK, where the Brexit vote June 23, 2016 was viewed as a mandate against privatization and against the Elite Consensus of the business and banking oligarchy and the media. Soon after the Brexit vote won, Prime Minister David Cameron resigned. The Jupiter-Saturn cycles tend to be identified most strongly by the conjunctions (every 20 years) and oppositions (every 20 years, or 10-11 years after the conjunctions), but in an election year coinciding with the Jupiter-Saturn square there are also certain important implications. It can release some explosive energy, especially as in this case, when Mars, Rahu and Ketu are also involved in the square pattern, and Mars remains conjoined with Saturn in Scorpio for some six months in 2016 (Feb. 20-June 17; July 12-Sept. 17). Also, Mars and Saturn are both retrograde in June 2016, with Mars very strong near its Stationary Direct position on June 29th. The big events of June 2016 were closely preceded by this Jupiter-Saturn square on May 26, 2016. I have discussed this pattern at length, including historically in terms of U.S. Elections over 100 years, 1916 to 2016. See the article here. Generally, the pattern that emerges is that the incumbent stays in the White House if the Jupiter-Saturn square occurs in fixed signs (sidereal zodiac). But since there is no incumbent candidate running for office this time, we may interpolate that the incumbent party (the Democratic Party) is likely to keep the White House, and further – a Democrat should also take the White House in 2020, according to the 160-year U.S. Election pattern, 1940-2100, that I found ca. 2001. The larger period I have identified as the EARTH period (1961-2199) has revealed itself to some extent in the basic American two-party political system, with alternative parties struggling for any traction. Within a decade of the 1961 JU-SA conjunction, we witnessed the two historically dominant parties (Democrats and Republicans) becoming more and more alike in catering to the oligarchy, the very wealthiest individuals and corporate conglomerates, to the detriment of the vast majority of citizens. This has caused a near collapse of the middle class in the U.S. and elsewhere, with less and less protection by nation-states from predatory corporate behavior. Without a nation’s right to enforce its own laws, there is ongoing degradation of workers’ rights and the earth’s environment. Almost 60,000 factories have closed in the U.S. since 2001, mostly due to trade policies and partly to automation. With increasing income inequality spreading across the world, 2016 looks like a possible turning point (somewhat like the effect of the JU-SA opposition) where opposing forces fight back against the dominant trends. In the 2016 U.S. Election season there are many citizens upset with the status quo and wanting a change in policies. There are those rallying for social, economic, and environmental justice; and those doing the same, but targeting other races, religious groups, or immigrants as the source of their problems, fueling racist, xenophobic actions both nationally and globally. Bernie Sanders fits the description of the first group, Donald Trump with the latter. Hillary Clinton talks the talk of Bernie Sanders but is expected to deliver to her corporate financial backers as the establishment candidate. The negotiations so far on the Democratic Party Platform do not indicate much else, and she has many Republican backers who expect she will deliver their own agenda, just as President Bill Clinton did. So in short, the intensity of 2016, especially through summer and fall, will show either that the dominant pattern of the EARTH period to date cannot be broken and will be further consolidated, or that some bold steps can be made at this time to counter the heavily materialistic trends. If Clinton still manages to become the Democratic nominee, despite the alleged vote theft from Bernie Sanders, and Democrats win the White House, she will have to do much more than she has indicated so far to turn the tide against oligarchic greed and lust for power. Meanwhile, what will happen if this major vote theft is revealed? And if it is not revealed by the corporate media or does not get through to a larger public, then we may have yet another indicator that current EARTH period trends are deeply entrenched and likely to continue to protect the oligarchs at the expense of everyone else. This New Moon chart for June 4th is a convenient roundup of the several events of note in June 2016, both planetary and otherwise: Event-wise, there was the California Primary June 7 (along with 5 other states), the Orlando Shooting June 12, and on June 23 Brexit (Britain votes to leave the EU). Prior to this we had the important Jupiter-Saturn square at 19:36 Leo-Scorpio on May 26, 2016, as mentioned; and following it we had the Jupiter-Rahu conjunction, exact at 22:12 Leo on June 24, 2016; and Mars Stationary Direct on June 29th. This New Moon chart has many extreme components to it. All planets are in fixed signs, with the exception of Mercury in late Aries, and in the Navamsha chart all physical planets are in just three houses: a Sankhya Shula yoga, which creates extreme and intense experiences, and at times victimization. Shula means “thorn,” as in “thorn in one’s side.” Classical malefic planets (Mars, Saturn, Rahu and Ketu) are intrinsically involved in the whole combination, with Saturn aspecting all of these planets in fixed signs, except for Ketu, with which it shares angles (kendras). When so many classical malefic planets are interacting mutually, as well as with the other planets, they set the tone for harsh, potentially violent or explosive events replicating human earthquakes. Further, Mars and Saturn are both retrograde, giving them even more strength as malefics, capable of aggressive, decisive, and potentially cruel actions. They also bring separating energy. Thus with Jupiter-Rahu conjoining in Leo, exact on June 24, and the Brexit vote in the UK June 23, the nation (Jupiter) separates from what it is conventionally expected to do, in this case remain with the European Union. The Conservative Prime Minister had urged a “remain” vote, and when it lost by a 4% margin, he promptly resigned. Rahu is the upstart, insurgent energy, and with the conjunction to Jupiter so close to the Brexit vote, it is symbolic of the first major nation (UK) to separate as a member nation of the EU, the world’s largest and richest trading bloc, fueling fears that other nations might follow suit and threaten the EU’s viability. Britain had been an EU member for 43 years. Mars is strong in its own sign of Scorpio, conjoined with Saturn and within 4 degrees of its Stationary Direct degree on June 29; Moon is exalted in Taurus; Venus is combust the Sun (29’ orb), thus more extreme in its condition and parameters, as is Jupiter, which is close to its exact conjunction with Rahu on June 23rd, and its exact square with Saturn on May 26th. Since Jupiter is in Venus-ruled Purva Phalguni nakshatra, it is impacted in June 2016 by the extreme condition of combust Venus, which is also impacted by the opposition from Mars and Saturn in Scorpio. Mars and Venus mutual aspects can indicate the search for triumphant worldly power, which can cause sexual energy to be either sublimated or wasted. There is an exaggerated need to fight and win battles, whether military, athletic, political, or social, including sexual conquests. Everything may be sacrificed to this end. Reset for London, UK this New Moon chart has an Ascendant of 3:40 Taurus, with 8 out of 9 planets all in the angles of the chart, indicating that events of this period for the UK are mostly overt rather than covert. And though results were shocking to many, there appeared to be no controversy regarding the integrity of the vote count, perhaps due to use of paper ballots. Set for the USA, the New Moon chart occurs in the 6th house opposite Mars and Saturn in the 12th house of hidden things. In the Navamsha chart, four planets are in the 8th house in Cancer (Venus, Sun, Moon, Mars). The 8th house is the least favorable position for the Moon. It is a house of suffering and of matters that are less known or concealed, i.e. another house of hidden things – also implicating shared moneys (8th house) and international affairs (12th house). Brexit has created chaos in the international markets, plunging the British pound to its lowest rate in 30 years, but causing a rise in the U.S. dollar. However, with the two major domestic events in the U.S. in June 2016 – the Orlando shooting (June 12) and the last 7 primaries (June 7 and 14) – these were events containing major controversy or behind-the-scenes controversy. The Orlando event was the most violent mass shooting in U.S. history to date in terms of the numbers killed and injured. With so many key planets in Houses 6 and 12, we see more of the war-like violence of the event, the people trapped inside a nightclub, the controversy over the shooter’s true motives (whether homophobic or ISIS-inspired), and how this affects gun laws, law enforcement, immigration, and LGBT rights. The shooter was a U.S. citizen, but a second generation Afghani by heritage who was twice investigated by the FBI. The Orlando event was also heavily politicized by the presidential candidates, and on June 22nd it sparked an unprecedented sit-in by up to 170 Congressional Democrats protesting lack of action on gun reform. The sit-in lasted over 24 hours, and though no legislative action resulted, Democrats vow to continue the fight after summer break July 5th. Regarding the California primary and the other five state primaries on June 7th, major malefic planets across Houses 6 and 12 help to describe the pre-emptive actions taken the night before the last major primary races, two of them of major importance delegate-wise: California and New Jersey. 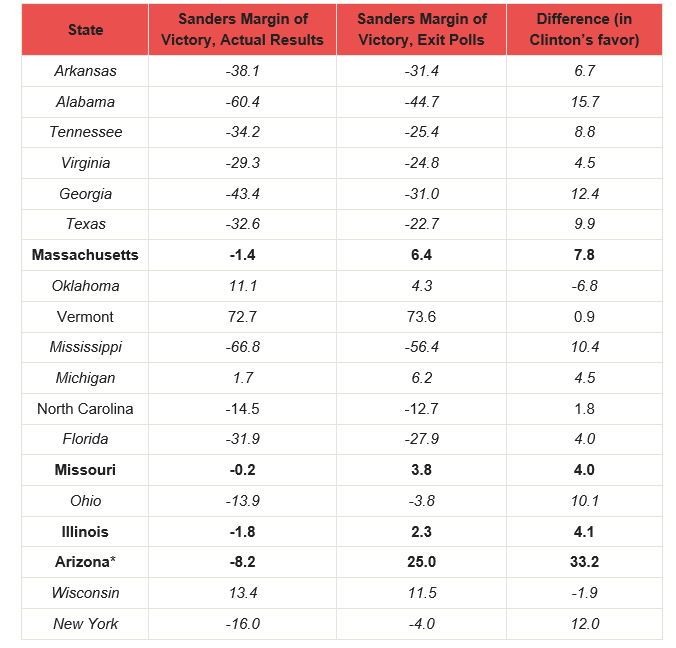 Sanders was counting on wins or high delegate counts in these states, so this was crucial for him as a candidate and a must-win for Clinton to rally her supporters and her Superdelegates, a controversial subject in itself. But the night before the Super Tuesday, completely ignoring protocol and ethics, Associated Press did a quick poll of Superdelegates and decided to announce Hillary Clinton as the presumptive Democratic nominee. This adversely impacted the voter turnout in many locales, as well as the down ballot votes, i.e. other state or local candidates on the ballots. The message was clear: Go vote if you must, but we have decided on the winner of the Democratic primaries. Your participation is unnecessary. 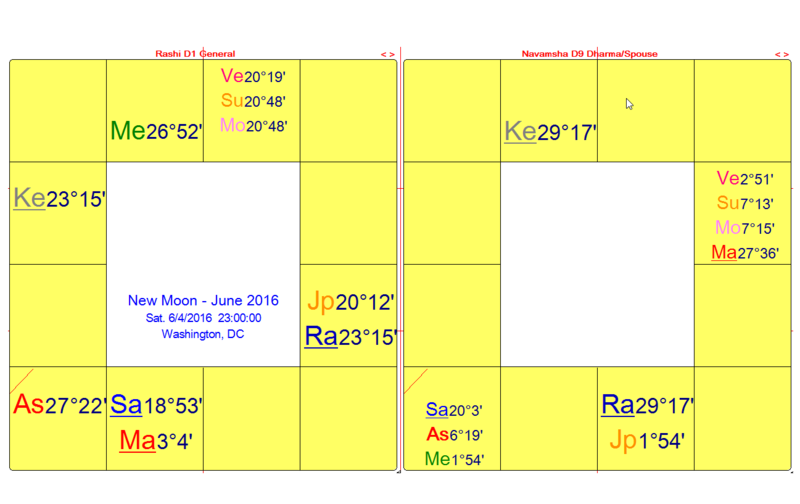 The June 2016 New Moon chart set for the U.S. capitol has a lot of action in Houses 6, 8 and/or 12, between rashi and Navamsha charts, thus potential litigation, with 6th house action, and more hidden components and more extremes involving scandal with Navamsha Moon and three other planets in the 8th house, as well as a Sankhya Shula yoga in the Navamsha. This yoga is associated with struggle and possible victimization, as mentioned earlier. Unknown as yet to the larger public, this pre-emptive action by Associated Press June 6th was considerably amplified through alleged massive vote rigging that made Clinton the victor in state after state, including California. With the California primary and her pre-coronation party happening under these planetary aspects, we have to wonder whether – if she is declared the Democratic nominee at the July convention – Clinton can rise above the illegitimacy of her nomination “win,” which if independent reports and/or lawsuits do not bring to light prior to the convention, surely Trump and the GOP will use against her, along with other ammunition such as the criminal FBI investigations currently pending. So far Clinton has managed to survive despite numerous weaknesses, some of them reflected in the long Mars transit in Scorpio in her 2nd house. Remaining tests may include tr. Mars Stationary Direct exactly on her Ascendant June 29th as well as tr. Mars returning to Scorpio July 12-Sept. 17, 2016, where it is ranked zero bindus and considered very weak. Right now the time is short prior to the July political party conventions and the November general election. The racketeering lawsuit being filed by Arnebeck and Fitrakis will need to have an impact very shortly to affect the Democratic nomination process. One factor to their advantage is the Jupiter return from 2004. (Jupiter’s orbit is 11.9 years.) These attorneys first began their voter fraud litigation with the 2004 Election and the racketeering lawsuit they filed over the vote machine rigging they claim stole the state of Ohio and thus the Presidential Election from John Kerry. Since that was a full Jupiter cycle prior to the 2016 election, this same team of attorneys may succeed this time in making some significant headway. Many people have pleaded with Bernie Sanders and his campaign to take action on the vote fraud/theft issue, but for whatever reason they have chosen not to do it. What is unique at this stage of the election process is that Sanders has not yet conceded the race, nor yet formally endorsed Clinton, though he has informally announced his support, mostly to oppose Trump. As of late June, he says that the Sanders and Clinton campaigns are in “almost daily negotiations.” So other than Sanders’ Democratic Platform measures, which have been mostly rejected to date (with bad news regarding no opposition to TPP – the Trans-Pacific Trade Partnership), we can only speculate what exactly is being negotiated. Whether the Establishment candidate can win in a year so wrought with Anti-Establishment sentiments is yet to be seen. In Dec. 2015 I predicted that Trump would be the GOP nominee and that a Democrat would take the White House, more likely an “insurgent” candidate (Sanders). Currently the Establishment candidate Clinton reigns, and the Vice Presidency is unknown. And whether the alleged massive vote theft from Sanders becomes a significant factor, or whether the media actually covers it, either way the planetary patterns indicate a tough and nasty election fight, with billions spent to try to control the outcome. Charnin, Richard, Proving Election Fraud: Phantom Voters, Uncounted Votes, and the National Exit Poll, 2010. Palast, Greg, Billionaires and Ballot Bandits: How to Steal an Election in 9 Easy Steps, 2012. Copyright © 2016 by Edith Hathaway. All rights reserved.